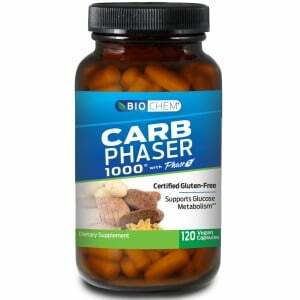 Biochem’s Carb Phaser 1000 contains an innovative ingredient called Phase 2 (white kidney bean extract). Adults take two (2) capsules before a complex carbohydrate/starchy meal. Do not exceed two (2) capsules daily. Use with a low-fat, reduced calorie diet and daily exercise program. As a reminder, discuss your diet and exercise plan and the supplements and medications that you take with your health care providers. Cellulose (capsule shell), gum arabic, cellulose, magnesium stearate, silica. Do not accept if seal is broken. Store between 59°-86ºF. Keep out of the reach of children. Caution: Not for use by pregnant or nursing women. If you are diabetic, hypoglycemic, taking medication or planning a surgery, consult your doctor before using this product, If any adverse reactions occur, stop taking the product and consult your doctor.